"3 major browser engines in one new alternative browser"
So, if you're reading this article you're probably aware yet of the existence of multiple browsers. Elsewhere on Winportal you can find a variety of alternative web browsers, some more popular than others, but the fact is nowadays the majority of web pages are written with the major three in mind. As such, many people have Internet Explorer, Mozilla Firefox and Google Chrome installed, as there are websites indicating their web pages are optimized for this or that browser. 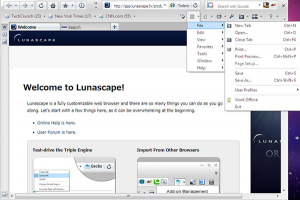 Now, with the free browser called Lunascape, presented here, you get triple engine support, which means this browser will open pages using the best engine for the site you visit, automatically detected. Besides this advantage, Lunascape comes with all functionality you might have gotten used to, such as tabs, a configurable search bar, bookmarks, skins and even new things you might want to find out more about.